Materials We Use — BP Autosports, LLC. Here at BP Autosports, LLC., we are well-versed in the use of a variety of different materials to in the construction of our parts. Each material possesses unique and beneficial characteristics, which allows us to make proper selections to construct the most durable, highest-performing components possible for our customers. Outlined below is a list of the materials we work with, as well as respective descriptions of each material to provide a better understanding of what exactly these metals are, and how BP Autosports products built out of them can benefit your project. 304 stainless is the industry standard for exhaust manifold, header, and exhaust system construction. This grade of stainless is readily available, and offers good longevity when proper wall thicknesses of tubing or piping are used. While it does not offer the resistance to thermal fatigue that 321 stainless does, it is an acceptable material to use for constructing exhaust manifolds, headers, and exhaust systems. We use 304 stainless as the standard material offering for our exhaust manifolds, with careful consideration taken to select appropriate wall thicknesses to provide our customers with durable, reliable parts that will not be the weak link on their project. 321 stainless is a stabilized, aircraft-grade stainless steel available as which we offer as an upgrade for our exhaust manifolds, headers, and exhaust systems. This particular grade of stainless steel is alloyed with titanium (i.e. stabilized), giving it superior resistance to corrosion, as well as increased resistance to thermal fatigue due to this additional corrosion resistance. Weld decay, or the loss of strength due in the heat affected zone (the area surrounding a welded joint) is reduced with 321 stainless as opposed to 304 stainless, providing further resistance to failure. With this added strength, we are able to construct exhaust manifolds out of thinner wall piping, providing manifolds that are lighter than their 304 stainless counterparts without sacrificing strength or longevity. 625 Inconel is an exotic nickel alloy we use in header/turbo header and exhaust construction when an extreme resistance to thermal fatigue and corrosion is necessary. This material is used for a variety of industrial and military applications, and in upper echelon racing (e.g. F1, Indy Car, NASCAR, etc.) where light weight exhaust components are required without sacrificing strength. 625 Inconel's extreme resistance to thermal fatigue allows us to construct parts out of much thinner wall material than either 304 stainless or 321 stainless (0.049" wall for turbo headers!). While difficult to obtain and work with, it is the material of choice for those seeking to compete at the highest level. Titanium alloys are light weight, extremely corrosion resistant exotic metals we use in the construction of exhaust systems, downpipes, wastegate dump tubes, and intercooler tubing. This material is used for a variety of industrial applications, and extensively in racing when unparalleled weight savings is necessary. Titanium exhibits an extraordinary strength-to-weight ratio, providing components that are extremely light weight without sacrificing strength and durability. An added bonus of titanium is its ability to be anodized, either by heat or electroanodizing process. This is due to the buildup of a crystalline layer on the surface of the material that refracts different wave lengths of light, presenting itself as vibrant colors on the surface of the material. While titanium is a demanding material to work with, it is the material of choice when weight savings are paramount, or artistic flair is desired. Aluminum alloys are light weight, strong alloys we use in the construction of intercooler systems, intake manifolds, radiators, catch cans, coolant fill pots, mufflers, exhaust systems, and a variety of other applications. Aluminum exhibits excellent heat transfer properties, which make it an ideal choice for radiators and intercooler systems, and is our standard material offering for intercooler tubing. 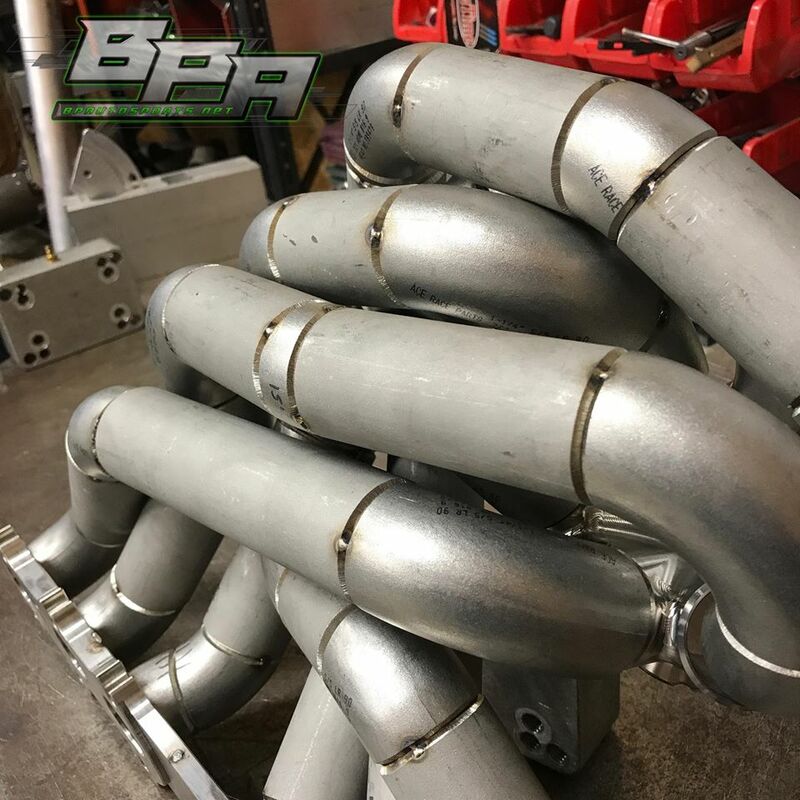 We construct exhaust systems out of aluminum, using tubing with additional wall thickness to provide durability and longevity, as well as custom mufflers to compliment our aluminum exhaust systems. Aluminum is easily attainable, light weight, and strong, giving it seemingly endless applications in the race shop. 4130 chromoly is a high strength steel alloy we use in the construction of roll cages. This material is widely accepted as the industry standard for roll cages by a variety of sanctioning bodies. 4130 chromoly is alloyed with chromium and molybdenum, giving it an excellent strength to weight ratio, as well as formability and weldability. We use this material as opposed to DOM mild steel to construct roll cages, allowing us to provide cages that are as light as possible, without sacrificing strength or, most importantly, the safety of the driver.